Slightly lost in the waters the past few weeks due to holiday time and damn well enjoying myself! The last push before my holiday had seen me drop to my lowest weight yet and a clothing size smaller – all of a sudden my wardrobe changed, as did my style and most importantly the way I was looking at food. To say I was faced with all the pictured cakes, you would be surprised to know I chose 5 x macaroons. I cannot quite believe it either, weight loss really is a funny journey! That does not mean to say I sat back and fully enjoyed a much needed slob out whilst away… if anything I returned home looking like I had been physically attacked! Archery, swimming, badminton, bowling, walking for miles and a midday run in 26 degrees possibly meant I was even more active than I am at home. Returning home was the hardest part actually… back to all my home comforts and also 3 weeks childfree. Apart from a few nights out which have involved food and cocktails and a stonking cold which rendered me useless for a day, I have been cracking on with my shakes in order to lose the excess. I have a feeling this will be the last time though, so I am savouring every munch on the delicious New You Plan chocolate puddings whilst planning the endless healthy meals I shall be eating in future. Whilst I had taken my Suunto on holiday to track my running stats, I returned home to a Milestone Pod, the latest running tracker from Milestone Sports that clips to your trainers and records all your stats in a very handy app. I shall most certainly be utilising the heat wave this next week to put the Pod to the test in time for the UK launch! How is the summer treating you? Do you find a weight loss journey harder to stick to when the weather is warmer or do you find you have a healthier lifestyle? If you would like to feature the #WeightLossWednesday badge, please take this code! Don’t forget to tweet us! 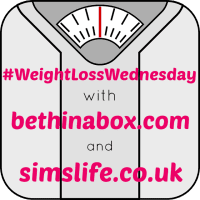 @SimsLifeBlogwith #WeightLossWednesday! Sounds like you’re doing really well, and so important to enjoy your holiday!